We have this tradition in my family where the one whose birthday we celebrate has to choose his/her lunch menu (you would have to ask my siblings and my parents to tell you whether there was one specific dish I always requested because I can't just think of one right now). This is my older brother's favorite salad. He would inevitably choose it for his birthday lunch menu and we would tease him about it because he was SO PREDICTABLE with his lunch appetizer! Since we started living away from each other (and now literally around the world), we started to pool birthdays. For instance, if we only see each other in July, then we'll pool the June/July/August birthdays together, making it a little bit trickier for the menu selection but never impossible! The advantage of pooling birthdays is that we get to celebrate someone's birthday a few times (let's say my brother and his wife would celebrate my brother's birthday with their children at their home and then with us/my parents/relatives on another day). The other advantage is that we have learned not to care so much about THE actual birthday day. Typically, in my family, we would celebrate the birthday on the week-end closest to the day, never on the actual day. Some people might find it strange; friends of mine loved it because it meant that if they were invited over for a Sunday meal, they would most likely be offered a great birthday meal! And if they happened to have their birthday close by too, they would be asked to chose their birthday menu as well! I have kept this tradition at home: we don't celebrate birthday on the actual day; we just make it work for all of us. We also let the birthday girl/boy choose the menu. With my children, we can expect French fries and chocolate cake these days! This salad is very fresh and easy to make. Depending on the dressing you select, it could be on the lighter (lime) or the not-so-lighter (mayonnaise) side. I personally served it with cream but added red hot sauce on my plate. 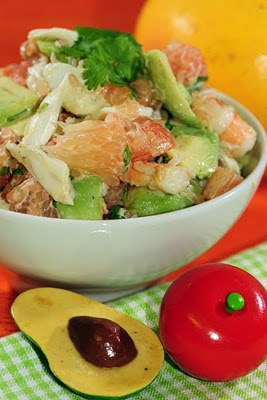 My children only complain about this salad was that there was too much crab and not enough avocado! I have heard worse! Bon Appétit! - 1 small pink grapefruit, peeled and all the different skins off. I had real crab meat left over from our Christmas dinner, so I used it in the salad but you could definitively use fake crab meat or canned crab meat. You could serve in the the avocado skins if you had sliced them in two and carved them or in the grapefruit skin as well. It requires a little bit more prep time. A lovely family tradition and a great salad. Great blog! So much good info and so many wonderful recipes. My daughter would say the same about the salad - not enough avocado! There's never enough in her opinion. Your salad sounds delicious! Ah avocados... they are so creamy and addictive! Au menu salade avocats, pommes raisins secs et ensuite blanquette de veau!!! peut-être de futures idées de recettes!